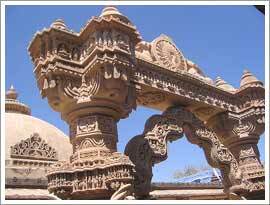 Osian is an ethnic village that is situated 65 kilometres off Jodhpur. Osian houses a cluster of ancient Jain and Hindu temples. These temples were constructed in between the 8th and the 12th century. Some of these old temples could not stand the ravages of time but most of these temples are intact till date. At present, Osian enjoys the limelight because of the 16 Brahmin and Jain temples it houses. Beautiful sculptures and intricate design of these temples fascinate even the most seasoned traveller. These structures not only inspire the art lovers but are appreciated by all holiday makers who come to see these temples from various corners of the globe. The most convenient way for a tourist to explore all the temples is to take a walking trip of the entire complex. Camel rides during the sunset are amongst the major highlights in Osian. This is an addition to the liveliness of your trip to Osian. When you ride on the back of a camel, you can explore the architectural marvels of the town, catch a glimpse of the shifting sand dunes, observe the changing shades of the sun and see certain other unexplored facets too. The camps and the desert resorts are a perfect accommodation option while you are in Osian. Enjoy the choicest of oriental cuisines followed by drinks and theme evenings. The experience of the ethnic dinner becomes memorable when accompanied by folk performances. Your Osian tour will be full of fun and frolic.